The bones of the human pelvis form a hard basin to contain and protect the organs of the pelvic cavity. Its rigid ring configuration also serves to transfer the weight of the trunk to the legs. Together, this ring of bones has the complex three-dimensional structure illustrated here. Based on sketches from a skeleton in the JCB Grant's Museum, this illustration demonstrates their curvature and form. The form of the male and female human pelvis can be distinguished using a few key characteristics. 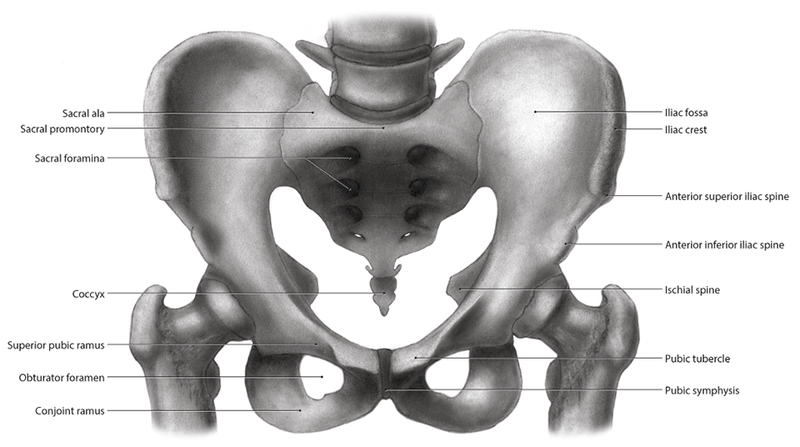 In particular, the male pelvic inlet, shown here, is heart-shaped (compared to the circular female pelvic inlet pelvic inlet, to accommodate the birth canal). The angle formed by the two arms of the pubic arch is also smaller in men. To create this image, I used brushes to paint powder from carbon pencils onto an illustration board, giving the piece light, shadow, and texture.